If you’ve needed to record your iPhone’s screen, you’ve undoubtedly been looking for a really good software to help you do that. If you’ve had little success finding the right one, you’ve come to the right place. Here we’ll share with you a number of really good Windows and Mac programs to record your iPhone’s screen as well as some iOS apps that do that quite well. This screen recorder for Windows is one of the best programs you can choose. It has a feature that automatically chooses a layout when more than one device is connected while allowing you to switch between devices. You can also choose to hide a device without disconnecting it. But perhaps one of its beat feature is its ability to mirror screens directly to YouTube, allowing anyone to view in real time. Step 1: Install the Reflector App on your device. Step 2: Swipe up from the bottom of your iPhone’s screen and tap “AirPlay” and then select your computer’s name. Scroll down to find the mirroring toggle switch. Turn it on and your iPhone screen should be mirrored on your computer’s screen. Step 3: In the reflector Preferences under “Show Client Name” set to “Always” and you should see the recording option at the top of the mirrored image on your computer. You can use “ALT+R” to begin recording. Another option for Windows users, X-Mirage also uses AirPlay to allow iOS device users record their screens. 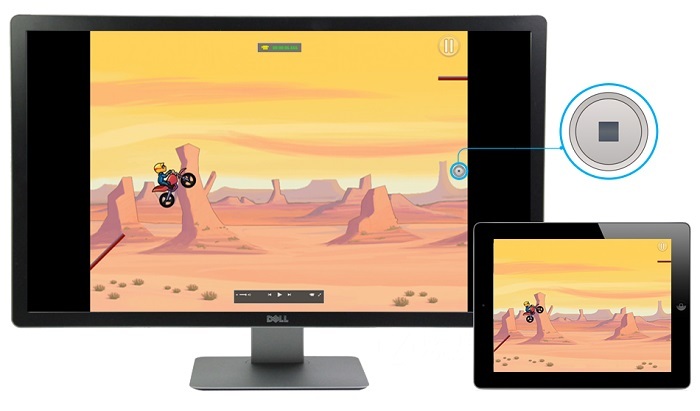 It also allows you to mirror multiple devices to your PC at once. It comes with a one-click recording feature allowing you to record demo videos, app tutorials and more and then export the recordings. Step 1: Swipe up to access AirPlay on your device and then select X-Mirage (Your Computer’s name). 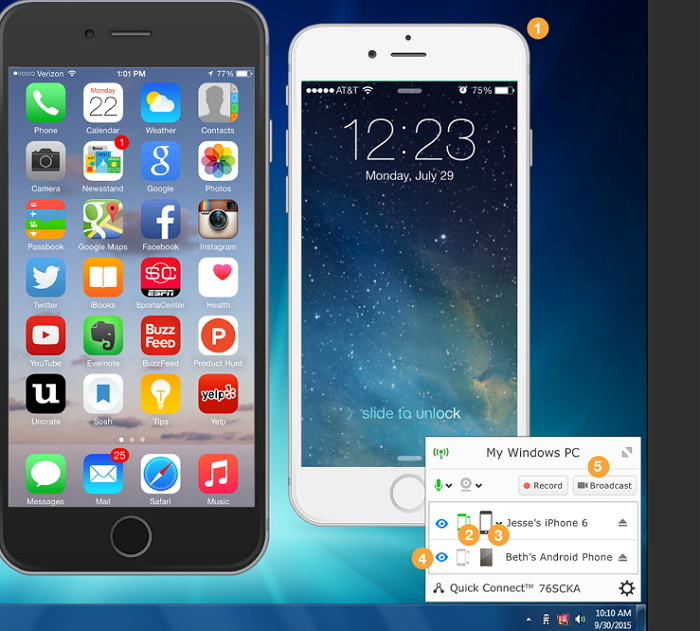 Turn on mirroring and then tap “Done.” Your iPhone’s screen will be mirrored on your PC. Step 2: Click on the red button to begin recording. The button is available when you move the mouse cursor to the mirrored window. It disappears three seconds later. 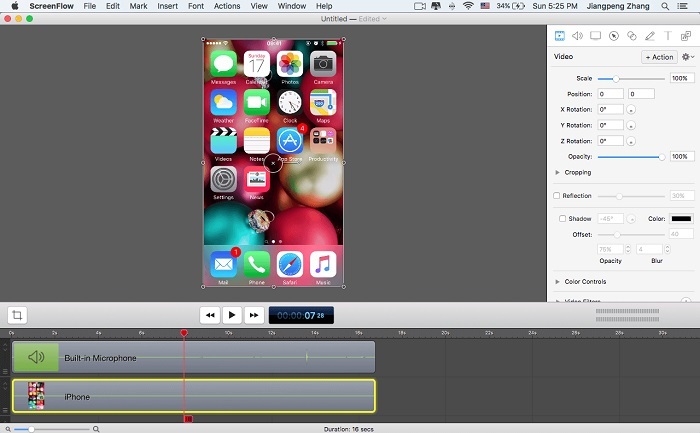 Step 3: Run any apps on your iPhone and then click the stop button when you’re done the recording. A window will popup allowing you to export the recording. 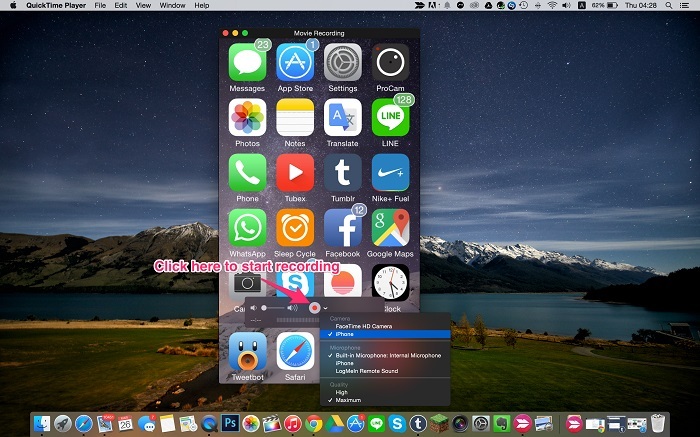 Owned by Apple, Quicktime provides users with a simple, yet effective way to record their iPhone screens. It is free to use and even comes with a built-in media-player that lets you view internet videos in a wide range of formats. Step 1: Connect your device to your Mac with a lightning cable and then open the QuickTime app. Step 2: Click “File” and then choose “New Movie Recording.” In the new recording window, click on the drop-down menu and select “iPhone” and select your iPhone’s mic. Step 3: Click on the record button and on the iPhone, start performing whatever task you need to record. When done, press the “Stop” button in the menu bar and then press Command-Control-ESC to save the video. ScreenFlow is a good alternative to QuickTime that allows users to capture the iPhone screen in brilliant detail while keeping the file size low. It also comes with a powerful in-built video editing feature that can be used to add images, text, audio and more. Step 1: Connect the iPhone to your Mac and Open ScreenFlow. Step 2: The program will detect the device and give you the option to record the device’s screen. Select the right device and check the “Record Screen” option from the box. If you want audio check “Record Audio” as well. Step 3: click on the “Record” button and start the app on your iPhone you want to record. Once the recording is done, ScreenFlow will automatically open the editing button. This app is an excellent solution when you want to record your iPhone’s screen without connecting the device to your computer. Step 1: Install the iOS Screen Recorder app on your device and then launch it.